Unique Mother's Day celebration by both Vishal and Raghava Lawrence yesterday has grabbed everyone’s attention in Kollywood. 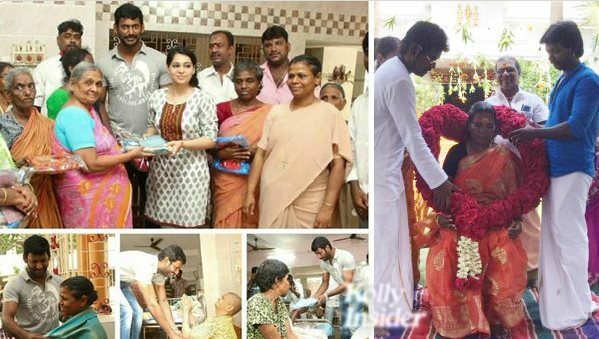 Actor Vishal made it a point of celebrating Mother’s Day in a very nice and helpful manner by hosting a wonderful lunch to two hundred elderly women at Mercy Home, an old age situated at the heart of city in Kilpauk. Both Vishal and his younger sister Aishwarya together were present for the occasion and distributed goodies and offered sumptuous meal to everyone out there. It is noteworthy that in the recent times, Vishal has been involved in many philanthropic activities and he feels it as a great blessing from these 200 mothers. Interestingly on the same day, Raghava Lawrence who is super confident with the success of Kanchana 2 has initiated the ‘Bhoomi Pooja’ for the temple which he is going to build for his mother Kannama. When some people are driving away their mothers to old age homes, here is a son who is building temple for his mom!